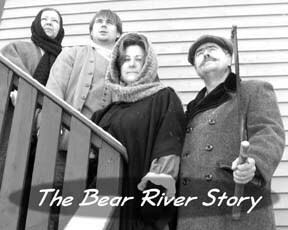 The Bear River Story was a great success in this, its inaugural year, with an audience of over 300 . By all accounts Hal Theriault did a great job dramatizing the History of Bear River. “The people loved hearing their stories.” And next year we hope to be on the street corners telling more Bear River tales. Many thanks for the support of the local communities who attended the two nights of performance at Oakdene. And thanks to the community of Bear River who supported the production generously with encouragement, volunteerism and going the extra mile. On behalf of the community we would like to thank Hal, and the cast and supporters for donating many hours of hard work. Bravo! A Dramatic Reading of. . . This year the Hessians, the Loyalists and the 60’s Flower Children all return to Bear River as their stories are enacted in the streets of downtown Bear River. beginning in mid-August in a new play by local writer/director Hal Theriault. The Grand Opening of The Bear River Story will take place at the Oakdene Centre, Bear River, August 18th and 19th, 2007, at 7:30 pm. A dramatic reading of The Bear River Story will be held at Oakdene on Saturday, July 14th at 7:30 pm. For further information, please call 245-5629.